We present a novel idea that allows several wireless radios to coexist on the same frequency bands while causing minimal interference. We present an innovative idea that can allow several wireless communication systems to coexist simultaneously in the same area and on the same frequency bands while causing minimal interference to each other. This work exploits the spatial dimensions of MIMO for coexistence, and is motivated by the scarcity of the electromagnetic spectrum. Our solution is commercially viable and can transform the way today's wireless communication systems share spectrum. The proposed mechanism is easily implementable in today's systems, does not need any special hardware, and the new radios can actually operate in a 'plug-n-play' fashion along with today's cellular networks. The MIMO Underlay team consists of three members, a Ph.D. student (Alexandros Manolakos), a Post Doc (Dr. Yair Noam) and a Professor (Dr. Andrea Goldsmith) in Electrical Engineering (EE) at Stanford University. The main goal of the team is to propose a cognitive radio technology that exploits the licensed spectrum while introducing minimal interference to the primary user. Alexandros Manolakos is currently pursuing a M.S. and Ph.D. degree in EE at Stanford University in the areas of Wireless Communications. Dr. Noam received his Ph.D. degree in 2011 in EE from Tel Aviv University. 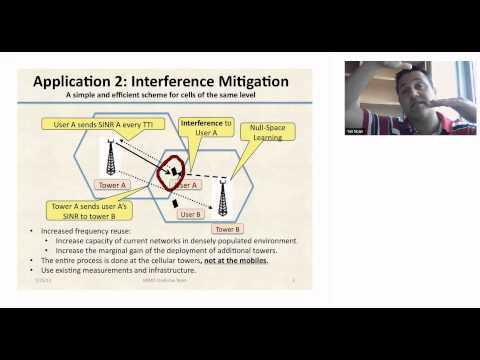 Amongst others, his current research interests as a Post Doc in the Wireless System Lab at Stanford University is on Interference mitigation in cognitive radio networks. Professor Andrea Goldsmith is a Fellow member of IEEE and of Stanford, and has received several awards for her work. Her research focuses on the design, analysis and fundamental performance limits of wireless systems and networks. About the Team: "The MIMO Underlay Team"
Alexandros Manolakos Team Leader Stanford University. Palo Alto. Great project.. it is really interesting.. Good luck!! Votes received after the cutoff time of 5pm EST were not included in the official tally. When included the team received 60 votes. (c) 2011 All Rights Reserved.